For many homeowners, the idea of a home theater system will often prompt research when it comes to design, brands, and components. However, if you feel overwhelmed when you start to shop around online, you will want to look at the help of the experts when it comes to home entertainment installation in Mukilteo. Even if you are generally someone who is pretty handy and enjoys do-it-yourself projects, something on the scale of a home entertainment space is best left to the professionals. Do you have an idea of what you are looking for in terms of home entertainment? Are you looking to transform your family room or would you like to create a room that is completely dedicated to movies and gaming? There are countless options out there, including smart home technology, whole home audio, and everything in between. Talking with the right team of professionals will not only help you to understand the brands and designs that are available to you but it may also give you some inspiration that you had not originally thought of. When you are calling around for estimates on your home entertainment project, explain to the installer exactly what you are looking for. This will give them a sense of not only your budget but also what you absolutely want to accomplish. If your home entertainment design is something on a larger scale, your installer will want to come out to do a site survey of the space. When you are doing a renovation project or a new home build, the plans can be drawn up in advance for your approval. For any home theater or family viewing space, you have the ability to pick out the seating, sound system, lighting, and all of the finer details that really make the desired space go from ordinary to extraordinary. 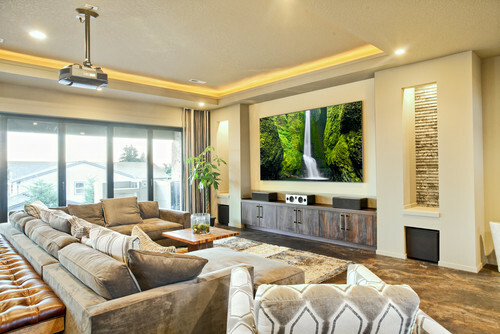 If you are thinking about home entertainment installation in Mukilteo, contact Home Entertainment Solutions today at (844) 437-4621 for an in-home consultation. Next PostNext What Can You Expect From Home Entertainment Consultations In Edmonds?